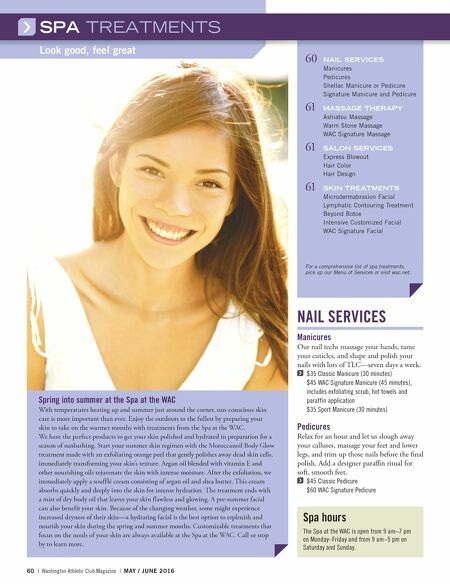 SPA TREATMENTS Spa at the WAC • 206.464.3090 • wacspa@wac.net • wac.net/spa 60 | Washington Athletic Club Magazine | MAY / JUNE 2016 SPA TREATMENTS Look good, feel great NAIL SERVICES Manicures Our nail techs massage your hands, tame your cuticles, and shape and polish your nails with lots of TLC—seven days a week. $35 Classic Manicure (30 minutes) $45 WAC Signature Manicure (45 minutes), includes exfoliating scrub, hot towels and paraffin application $35 Sport Manicure (30 minutes) Pedicures Relax for an hour and let us slough away your calluses, massage your feet and lower legs, and trim up those nails before the final polish. Add a designer paraffin ritual for soft, smooth feet. $45 Classic Pedicure $60 WAC Signature Pedicure Spa hours The Spa at the WAC is open from 9 am–7 pm on Monday–Friday and from 9 am–5 pm on Saturday and Sunday. 60 NAIL SERVICES Manicures Pedicures Shellac Manicure or Pedicure Signature Manicure and Pedicure 61 MASSAGE THERAPY Ashiatsu Massage Warm Stone Massage WAC Signature Massage 61 SALON SERVICES Express Blowout Hair Color Hair Design 61 SKIN TREATMENTS Microdermabrasion Facial Lymphatic Contouring Treatment Beyond Botox Intensive Customized Facial WAC Signature Facial For a comprehensive list of spa treatments, pick up our Menu of Services or visit wac.net. Spring into summer at the Spa at the WAC With temperatures heating up and summer just around the corner, sun-conscious skin care is more important than ever. Enjoy the outdoors to the fullest by preparing your skin to take on the warmer months with treatments from the Spa at the WAC. We have the perfect products to get your skin polished and hydrated in preparation for a season of sunbathing. Start your summer skin regimen with the Moroccanoil Body Glow treatment made with an exfoliating orange peel that gently polishes away dead skin cells, immediately transforming your skin's texture. Argan oil blended with vitamin E and other nourishing oils rejuvenate the skin with intense moisture. After the exfoliation, we immediately apply a soufflé cream consisting of argan oil and shea butter. This cream absorbs quickly and deeply into the skin for intense hydration. The treatment ends with a mist of dry body oil that leaves your skin flawless and glowing. A pre-summer facial can also benefit your skin. Because of the changing weather, some might experience increased dryness of their skin—a hydrating facial is the best option to replenish and nourish your skin during the spring and summer months. 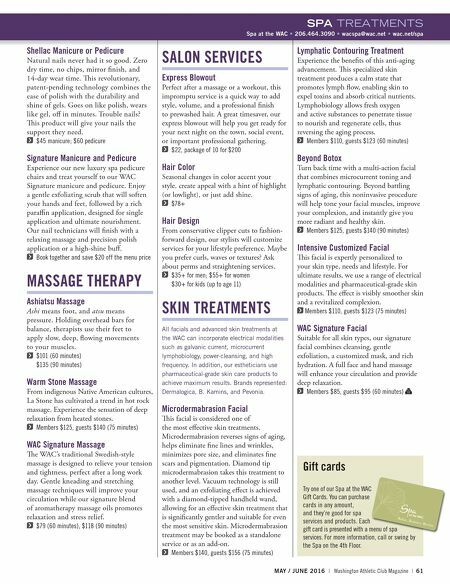 Customizable treatments that focus on the needs of your skin are always available at the Spa at the WAC. Call or stop by to learn more.